In the recent past, Facebook was hounded by controversies due to Facebook’s Cambridge Analytica scandal which you must be aware of. Following the controversy, a lot of people concerned about privacy decided to leave the largest social media platform. Perhaps, if you want to delete your account and get rid of Facebook then it’s advised to take a full backup of your Facebook account. 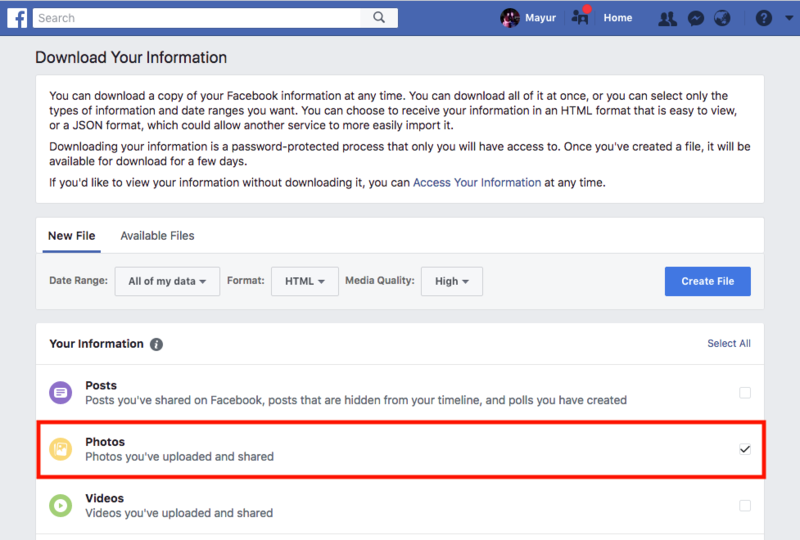 It’s a fact that Facebook lets you download a copy of your data which includes your posts, photos, videos, chat messages and more. Post the infamous controversy, Facebook has changed the way as to how users can download their data. Earlier, there was only an option to download your entire Facebook archive which included all your information. Not anymore! You can now select the specific information or data that you wish to download and for a specific date range. Hence, if you want to just download all your Facebook photos at once for an offline backup then that’s possible. Firstly, go to Facebook and click on the down arrow from the top right corner. Click the “Settings” option in the menu. In General Account Settings, click the option that says “Download a copy of your Facebook data”. Under the new file tab, click on the “Deselect All” option and only select the checkbox next to the “Photos” option. Optional – You can select the date range and the format to receive your information. The HTML format makes it easy to view photos offline while JSON format makes it easier to import data to another service. In media quality setting, choose “High” to download photos in the best quality. Then click the “Create File” button. 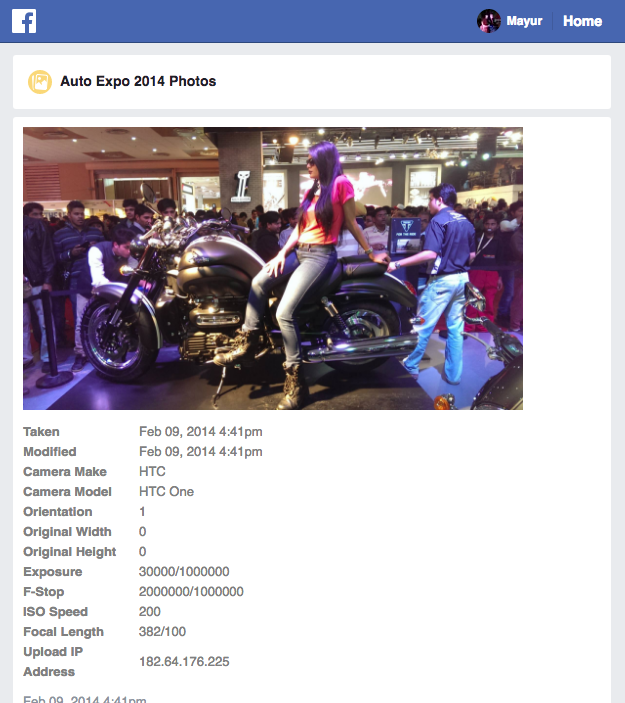 Facebook will now show that your file is being processed. After a short while, you will get a Facebook notification and email stating that “Your Facebook data is ready for download”. Click on the notification and you can now see the photos archive under Available Files. Click on the “Download” button. You now need to enter your Facebook password for security reasons before you can download the file. After clicking Submit, the downloading will start. Note: The created file will be available for download for 4-5 days. Also, the file size could vary depending on your data, mine was 360 MB. The downloaded archive is a ZIP file. Extract it to a folder and navigate to Photos folder. The directory will contain sub-directories for every album uploaded by you on Facebook. Besides, there are albums for profile pictures, cover photos, mobile uploads and timeline photos that you can easily figure out. Also, an HTML file exists in the photos folder that allows you to view all the photos in their corresponding albums with great ease. 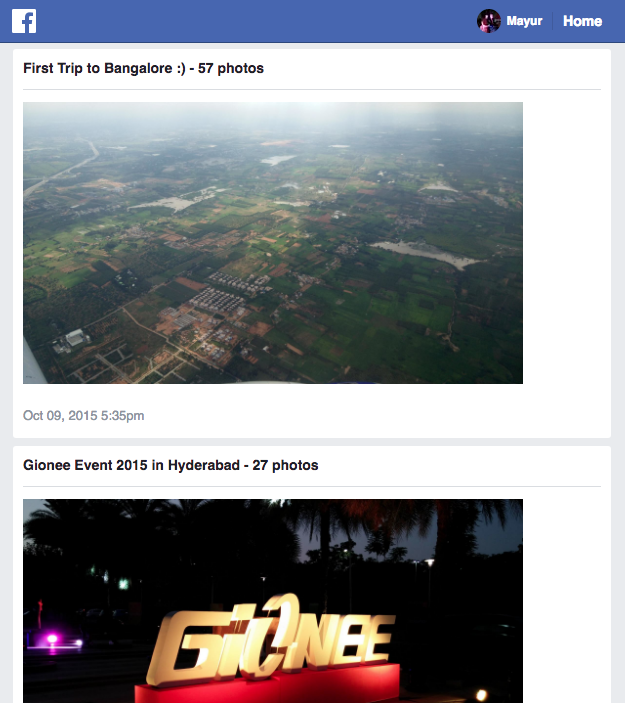 The file opens an offline version of Facebook with all the photo albums. Opening an album shows all the photos inside it along with the EXIF data and comments for individual photos. You can also click on the images to view them in full-size. That’s it! Now enjoy all photos ever posted by you on Facebook without digging your profile. Tip – You can also download individual albums on Facebook in case you don’t wish to download all the photos. To do so, go to your profile > Photos > Albums > open an album and click the gear icon. Then click on “Download Album”. Facebook will notify you when the album is ready to download. Next story Why Use Sticky Navigation? Any way to download all photos from album other than yours?